The State Department is blocking Congressional access to key first-hand witnesses of the 9/11 Benghazi attacks, citing a need to protect their personal safety. “We understand the committee’s interest in interviewing these agents and I’m sure the committee does not want to take any action that would create risks to their personal safety or their ability to do their jobs,” Deputy Assistant Secretary of State Joel Rubin said during his opening statement at a hearing today of the Benghazi Select Committee. The State Department revealed that is is also concerned about jeopardizing the Justice Department investigation being carried out by Attorney General Eric Holder. “We want to avoid interfering with the Department of Justice’s ongoing investigations and prosecutions,” Rubin said. He added that the State Department was “hopeful” an accommodation with the committee could be reached. Gowdy questioned Rubin’s statement that somehow the Benghazi committee would endanger the Justice Department investigation by conducting interviews of the witnesses, when other agencies were allowed to conduct similar interviews including the State Department’s independent review board. “Sir, I’m not an attorney, I’m not a prosecutor,” Rubin replied, asserting that the Justice Department was the agency that warned of a negative impact. Gowdy pressed Rubin about the importance of allowing the committee to hear testimony from the witnesses. 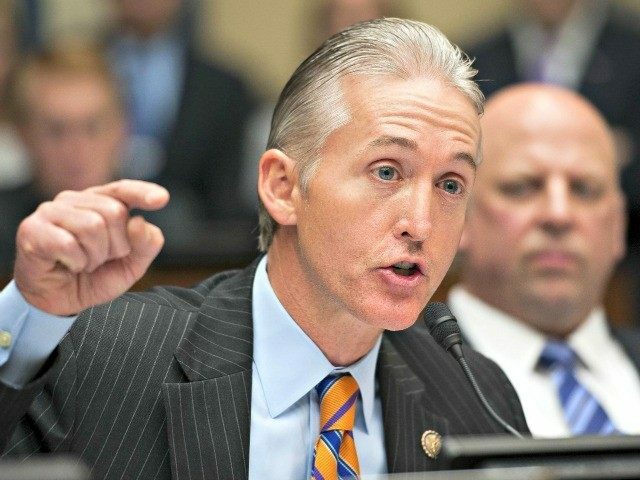 “If six people observed an important event and you were being asked to write a final definitive accounting of that event, how many of the six would you want to talk to?” Gowdy asked. Rubin stumbled, failing to directly answer the question.